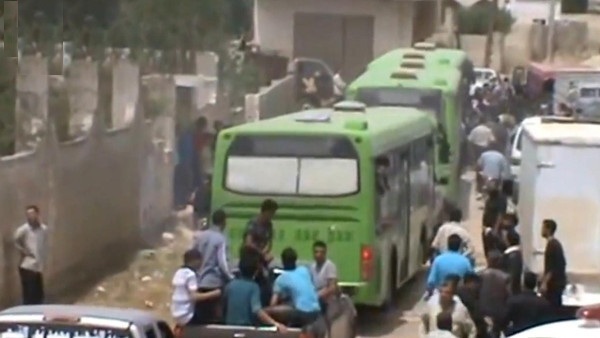 JNN 09 May 2014 Damascus : An operation to evacuate about 2,000 militants and their families from rebel-held areas of the Syrian city of Homs has started under the supervision of the UN. On Wednesday, buses began leaving the Old City under a deal brokered by the United Nations, according to media reports. The evacuation of Syrian rebels from their last stronghold in the central city of Homs resumed on Wednesday after brief suspension following reports that humanitarian aid access to two villages in the north was being stalled. The Syria Live Network has aid access into the towns of Nubl and Zahraa in the Aleppo province was being hindered. Under the deal which allowed for the evacuation from Homs, the rebels agreed to ease their siege of the Shiite towns of Nubl and Zahraa. The Syrian Observatory for Human Rights said rebels had opened the roads to allow aid into the two northern towns on Wednesday morning at the same time as the first buses collected the departing rebel fighters from Homs. At least three buses arrived in rebel-held territory to the north, carrying a number of armed fighters. “Three buses have left, carrying 120 people in total, a mixture of wounded and non-wounded civilians and Terrorists,” Abul Hareth al-Khalidi, a rebel negotiator, said. Homs’ governor also confirmed the launch of the evacuation. A rebel negotiator told AFP that 2,000 fighters and civilians had started leaving Homs as part of the evacuation agreed between foreign Infested terrorists and forces loyal to President Bashar al-Assad. The deal also calls for the release of captives held by rebels in Aleppo and Latakia provinces, and the easing of a rebel siege of two Shiite towns in northern Syria. A video posted online by opposition activists showed a group of fighters, some with their faces covered with black or white scarves, walking in a line towards green buses. Reports say the militants were sad and bitter since they were unable to defeat government troops after two years in the city. They carried backpacks and light weapons as they boarded the buses to head out of the “capital of the revolution” which has been under army siege for almost two years. The fighters, reportedly almost all Wahaibis, had held out in the Old City of Homs and neighboring districts despite being undersupplied, outgunned and subjected to more than a year of siege and bombardment by Assad’s forces. The evacuation comes after months of gains by the army, backed by its Lebanese Shiite militia Hezbollah, along a strategic corridor of territory linking the capital Damascus with Homs and Assad’s Alawite heartland on the Mediterranean. The final rebel withdrawal from the center of the city, known as the “capital of the revolution” where protests first erupted against Assad in 2011, would consolidate Assad’s military control ahead of a June 3 presidential election. It marks the end of any militant presence in the heart of the major city once dubbed the capital of the uprising against President Bashar al-Assad. The fighters are expected to leave Homs in up to nine convoys, carefully synchronized with the aid delivery and the release of captives held by the terrorists near Nubl and Zahraa, and the town of Kassab in Latakia province. One activist said a Russian national and several Iranians were among those being released by the rebels. There was no independent confirmation, but Moscow and Tehran have both supported Assad in the three-year-old civil war. More than 150,000 people have died in the conflict. Millions more have fled their homes and the government has lost control of swathes of territory across the north and east. Fighting regularly kills more than 200 people a day. Provincial governor Talal Barazi said Wednesday’s operation would ultimately clear the whole of Homs city of gunmen and weapons, suggesting rebels would also be evacuated from the suburb of al-Waer on the city’s northwestern outskirts. Rebels in al-Waer and districts around the Old City have held out against Assad’s forces since the army drove them out of the ruins of Baba Amr district, epicenter of the rebellion, in March 2012. Since then, the army has gradually tightened its grip around rebel areas, blocking weapons, medical supplies and food. It allowed hundreds of civilians to leave in February after lengthy U.N. mediation. Assad is widely expected to be the runaway victor in the vote,Due to his stead fastness on his Motive in the best Interest of his Country and the region , otherwise his little mistake would have changed Syria into another Libya, which is now mostly controlled by Wahabi Militias , Ruining the country and its resources , and creating Uncertainity in the whole of the Region. Assad was always Popular among the masses of Syria, but it was under a International Plan in which Saudi Arabia was a Key Player , tried to destabilize the Country , by trying to convert into another Afghanistan, where their created and sponsored Taliban , have created a Havoc and have created Chaos in the Region, but as the Saudi Monarchy has been widely been categorized as the supporter of terrorism and fanatism , around the World. And Due to the Wise and Strategic Partnership Between Russian and Chinese , the Only Super Power of World US , has even to Bow , and to go on Back foot , as they could not face their People in their country , who are now totally against US Guerrilla Wars , around the World , to keep its Hegemony , due to which the Key Politicians and Player of the Government can make their fortunes , but the Innocent People of US and Britain has to suffer , at their Cost . It also Marks the Third Biggest Victory of the Shiite forces and their Allies , as the First was the Iran – Iraq War , where Iran countered the Threat ,for almost Ten years , against the combined enemy of evils , which was headed by Saddam Hussain , but finally the Stead fastness of the Iranian Nation Stood Victorious , and the World Came to know of the Power of Real Muslims , whom they thought are all like the Saudi and Persian Gulf Countries , Including Egypt that only a couple of attacks and a couple of days of War will lead them to surrender infront of them and come to their terms , but the experience led them to Believe totally Opposite. Second was the Direct War of Hezbollah fighter with Israel , in which Israel has to recognize the Might of the Brave Shiite Warriors , and it was then when they Planned and Conspired with the Black Sheeps of Muslims the Saudis , to create an atmosphere in Syria that any how they can Dethrone Assad , but as the results have been rolling out , they have once again fallen face front to the Ground , as even after Putting every Pressure and Billions of Dollars in the Support of the terrorist , but now finally they are on the Surrender , while it is not easy for neither for the Saudis nor for the West and US to digest their defeat , so easily , and even now they are trying to Buy Out , Politicians like Nawaz Sharrif , to help them out in leasing the Pakistani Army , so they can Implement their , evil designs , But at the Moment it looks a bit difficult , as the Leadership of Pakistani Army , is in no mood to support , Once again the Terror groups , which Once they Nurtured , but who have in Return , Slaughtered the Sons and Brothers , of the same Pakistani Army. Meanwhile, the terrorist group of the Islamic State of Iraq and the Levant (ISIL) has executed at least four members of a rival militant group, the so-called Free Syria Army (FSA) in eastern Syria. The executions were carried out in the city of Deir ez-Zor on Tuesday, according to Al-Alam. Nearly 200 militants have been killed in the recent infighting between rival terrorist groups in the region. The deadly clashes have forced 60,000 people to escape their towns in the eastern province. The new clashes between the rival militant groups continue to rage despite a recent call by al-Qaeda leader Ayman al-Zawahiri to stop the infighting and focus on battling the Syrian government. This entry was posted in Jafria, Middle East and tagged a, Assad, ISIL, president assad, Syrian Forces, Wahabi Terrorists. Bookmark the permalink.